This would be some of the smoothest FPV footage I have ever recorded with a fixed wing. The Mini Talon is a terrific platform. Playing around with GoPro timelapse settings with a 3-axis gimbal onboard the Mini Talon. Here's a compilation vid of some recent adventures with planes. Most of this footage was shot with the Mini Talon. Here are my 2 favorite fpv planes. Multiplex Heron and X-Uav Mini Talon. Both are set up with Eagle Tree Vector flight controllers with antenna tracking and reliable RTH. The Heron is fairly new, its very stable and gentle to fly. Medium range flights and fun for loops, rolls and inverted flight. The Mini Talon is an all-rounder, good for medium to long range flights but mostly used for formation flying and recording HD with the runcam2. 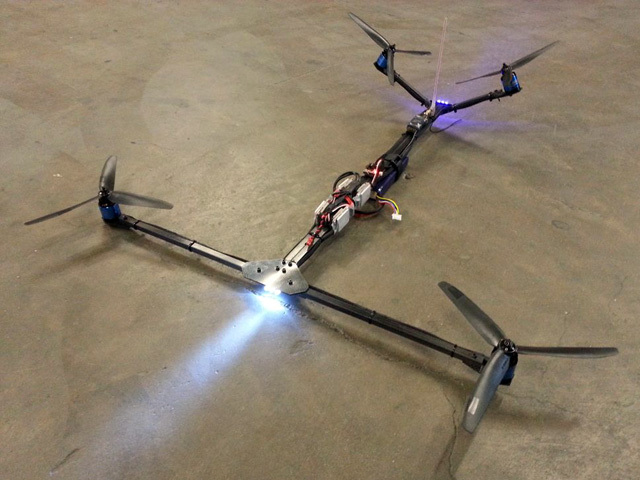 V-tail Quadcopters seem to have become all the rage. Flitetest have just done a V and i'm seeing more discussion about them on RCGroups recently. Well, here is my spin on the v-tail design. Its a full carbon fibre folding frame with SimonK F-30 ESCs, RCTimer HP2217 800kv motors, GWS 9x5x3 props and runs 4S 2650 lipos. It has a dragon link rx and the HK Nanowii flight controller. 5v LEDs front and rear for LOS flying and a removable 1.2g FPV pod. Here is a clip featuring my latest custom multi-rotor, the V-Tail Quadcopter. Its decked out with LED strips and a super bright 12W LED spotlight up front for night flying. Slow shutter speed pics of my night flying tricopter. Here are some pictures of my aerobatic t-copter. I've been flying this one for a while now starting off with a KK Blue board then a HobbyKing V2 KK board. The KK boards were fun and easy to configure but now i've upgraded it again to a MultiWii controller. Using the popular MultiWii thread as a guide I built up a naked Paris 4 shield with the Arduino Pro Mini 328 and the gyro board from a Wii Motion Plus. Wow!! What a difference the MultiWii makes. This one offers advanced configuration and excellent stabilization. I've been able to push the t-copter a lot harder performing faster and tighter flips & rolls with much smoother flight in between. I'm still trying to find the best settings with the MWC gui. Definitely won't be going back to a KK board anytime soon!! Here it is - my first ever FPV video. Its taken me a very long time to get all the gear sorted and learn how to fly FPV style comfortably. The quadcopter is the Scarab Euro from MultiWiiCopter.com. A GoPro HD camera was mounted up front. My simple FPV setup designed for a quick & easy deployment. The Scarab Quadcopter fitted with the Paris 4 board. It flies very smooth and makes for a great FPV platform.